I love going to weddings! And it makes me so happy to be invited to each new one!! As I sit and listen to newlyweds make their vows to each other, it always reminds me of the vow I made to Blake and God on our wedding day! And, I must admit, sometimes those reminders come at just a right time!! A lot of times I'm convicted: sitting there in my best dress, usually holding the hand of the man I love, realizing that I haven't been the wife I should be, lately... Haven't really been the wife I promised to be! Weddings make me a better person!! And then, weddings give Blake and I the opportunity to hit the dance floor and make so many wonderful memories doing something we love to do together!! I. LOVE. WEDDINGS! We recently went to a wedding of a very young couple we've watched grow throughout their relationship with each other... We knew them before they even started dating, and now we've witnessed them get married!! And after thinking back on their night over the last 2 weeks, I think it was probably the best wedding I've ever been to!! Not because the food was good, or the music was good, or even the ceremony itself was good (though they all were), but because of the love that the couple showed for each other!! Do you know anyone like that? A couple whose love for each other exudes every wonderful thing a marriage is supposed to be!? Watching those 2 love each other was such a blessing in my life that week!! As a girl who has grown up in a Christian home, and who deeply desires to follow the Lord's will in her life everyday, I am well aware of why marriage was created and what its supposed to represent! Wives are to love their husbands as the Church loves Christ, and husbands are to love their wives as Christ loves the Church. Impossible standards for any sinner to meet alone, but wonderful goals for any redeemed sinner to aim towards!! Weddings always seem to renew my desire to be the woman I stood in front of a church full of almost 200 people and promised to be... To cherish, forgive, serve, put before anyone else, take care of, and most of all LOVE Blake Furtick for the rest of forever! For those of you who aren't yet married, its so much easier said than done, but is so worth the effort!!! The couple at the wedding we just attended seem to do it all so well, and from such an young age!! And I think that's simply because they put the Lord first in their lives, and in their relationship!! As an audience, we all sang a worship song at the end of their ceremony because they wanted nothing more than for the first thing they did as a married couple to be worshiping their Lord and Savor!!! I know what you're thinking... But believe me, it wasn't just for show!! This was the most simple ceremony and reception I've ever been to... One that was completely void of the typical pomp & circumstance that's stereotypical of a Southern wedding. And because it was simple, there was more room for JOY! Everything they said and did was 100% authentic and genuine, and full of LOVE! Love for each other, and for God!! It was such a beautiful evening, and I'm a better person because of it!!! The wedding was the Saturday before Hurricane Irma hit South Carolina on the following Monday.... It was actually a pretty chilly evening because of all the wind... Not too cold, but not typical SC Summer weather either, giving me the perfect temperatures to test out this LOVELY dress from Tobi.com. It was so fitting for such a perfectly LOVELY evening!! It has a romantic cut, with a backless detail! And is actually called "In Love Halter Maxi Dress"!! It was too perfect for Fall wedding attire that I just couldn't pass it up!!! The slit is high, so I had to be careful with the heavy winds that night, but since that was atypical weather, I don't see why this dress wouldn't be the most perfect Fall and Spring wedding-attending dress ever!! Not to mention the fact that EVERY lady at the wedding except for the bride, the coordinator, and one other female were all wearing blue! I usually pay more attention to trending outfit STYLES than COLORS, but seriously y'all, it wasn't something I could stop myself from noticing... So keep it mind, that if you're attending a wedding this season, apparently BLUE is the color you need to wear!! 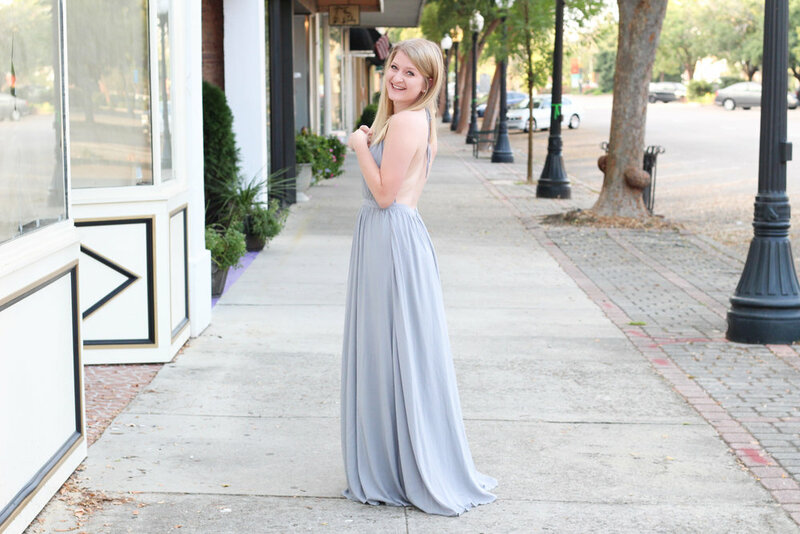 Which makes THIS periwinkle maxi dress all the more perfect, because its in the blue family, but different enough that you won't be wearing the exact same shade as everyone else, but will still be wearing the IT color for Fall wedding attendees!! My advice on wearing this Backless Little Black Dress to a Fall/Winter/formal wedding would be to get one of those super trendy faux fur wraps to put around your shoulders later on in the evening!! I don't have one yet, but plan to get one before that particular wedding!! So excited!!! These 2 dresses were provided to me by Tobi.com, but all photos, thoughts, and opinions are my own!